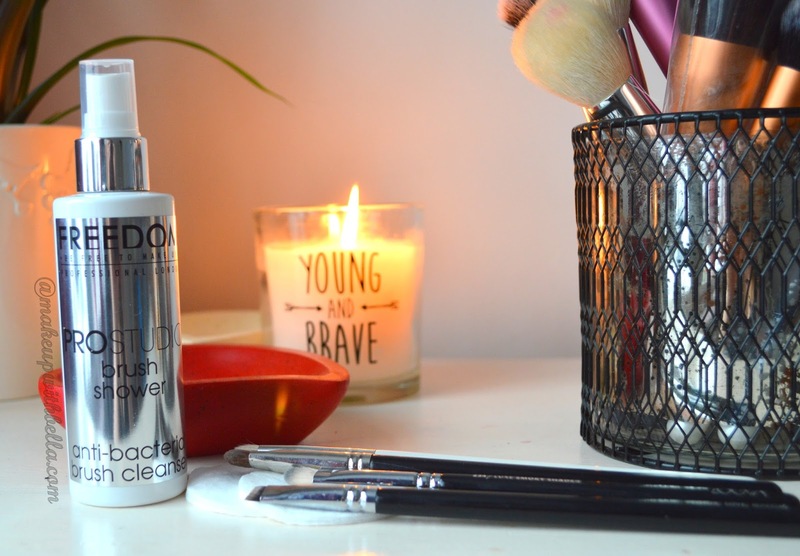 Makeup with Bella: FreedomMakeup London Pro Studio Brush cleanser- short review! 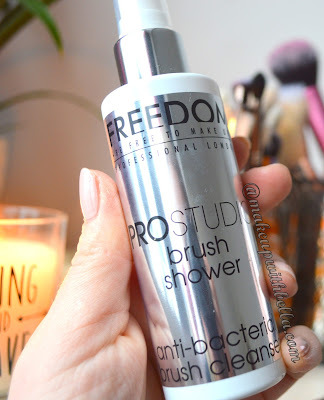 FreedomMakeup London Pro Studio Brush cleanser- short review! Being in the theme "my cosmetics Freedom Makeup London", today its turn of the product namely Studio Brush Brush Antibacterial Shower. And if you're curious about my opinion on FreedomMakeup London Eye Primer Pro or Pro Brow PomadeFreedomLondon also invite you to read! In a very cool handy bottle with dispenser we've got 100 ml of the product. In the composition except the water and alcohol denat. in third place is Hamamelis Virginia Water, which works additionally antibacterial, regenerating and rejuvenating. Great product, very thoroughly cleans and disinfects at the same time without having to wash brushes in water. The smell is alcohol- free and very pleasant. The manufacturer recommends spray 3 to 4 times directly onto makeup brush and then gently wipe the brush across a clean tissue or cloth to remove the makeup. However, I clean my brushes in some other way: spray 3 times on cotton wool and with gentle circular motions clean the brushes. This one application lasts me for about 3 to 4 brushes (I'll add that I'm talking only about eyebrushes). If you want to clean your brushes in a quick way without using any makeup remover or soap, you have to try it. The cost of this bottle is £5.00 only. I highly recommend it!!!!!! Like the all FreedomMakeup London cosmetics, available to get at Superdrug or order online. To sum up, my bits of Freedom London, they are great and very affordable, especially pomade and eyebrow brush shower. I have not had a chance to try other cosmetics brand yet, but everything ahead of me !!! Maybe you could recommend me some? 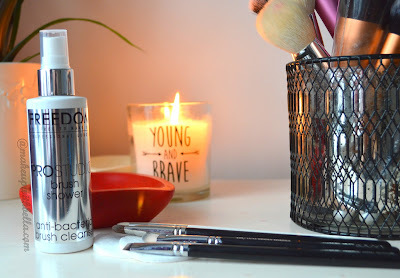 Great review :) I currently use Primark spray and it works well for any dirty brushes after use on powders. It doesn't work too great with anything that's liquid based tho. I must give this one a go. Great review Hun. I was interested in this product. I use Primark's one but its only good for brushes dirty from powder products and not the liquid ones.